The Dail Arch | Pub Quizzers | Find a pub quiz near you, now. 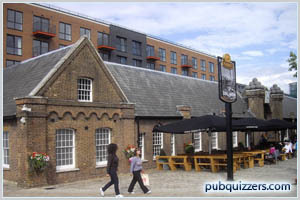 Pub quizzes take place at The Dail Arch, Woolwich Arsenal on Sundays (weekly) at 20:00. Entry is £2.00, you can have up to 6 people on a team. There are prizes of spot prizes, drinks. Happy quizzing! 40 general knowledge questions including music & picture sheet. 2nd prize: Bottle of wine. Plus 'Play Your Cards Right' to win one of the free drinks during the quiz.